Revisiting a TrueHoop staple. And watch Bucks-76ers with us on Thursday. It’s Bucks at Sixers on TNT. David Thorpe and I will be hosting an invite-only watch party on Slack. (If you’re on the TrueHoop.com email list, we will send you an invite on Thursday.) Every time I watch a game with David I learn stuff. Should be fun. Giannis going from 33 minutes per game to 40 is the single biggest adjustment available to any playoff team. the raptors just served us some delicious chicken wings in the media room at halftime. If they think i can be bribed they are correct the raptors are the best organization in sports and will win the championship this season. We might never understand all the issues—historical, psychological, racial sociological, hormonal—that feed the quiet psychodrama of Russell Westbrook’s relationship with Oklahoma City beat writer Berry Tramel, whose questions Westbrook has long refused to answer. Tramel’s side of the story, explaining why he’ll never stop asking them, reads like the opening monologue of an off-Broadway play about loss. I’m as delighted as anyone by Trae Young. I want to watch! But let’s understand why he shouldn’t win Rookie of the Year: He is the worst-rated NBA defender. Dead last. It’s not his fault, necessarily, as a tiny rookie guard. Nor is it a criticism, but that’s where we are. Dwyane Wade and Gabrielle Union recently bought a lovely house that features a clean modern look. They have a lot of wall space for dramatic wall hangings. But his retirement tour is loading him up with high-school-sports-banquet style things in frames. It’s well-meant, but does anyone reading this really think it’s going on those walls? A house that size probably has enough basement or garage space, but you know what Marie Kondo would say. I asked David Thorpe who, among players left in the NCAA tournament, has an NBA future he is excited about: “I love Jared Harper. Auburn's ‘mini-footer’ (meaning 6-feet-at-best) point guard. I don't have any clue if he's on anyone's radar but mine. He reminds me of Bobby Jackson, who sizzled passed anyone and everyone for Minnesota and carried them to a Final Four I was there to witness. Harper has a place in the League as one of the fastest guys with the ball who can make 3s and free throws at a very good rate. Speed and shooting rank higher that size, for me, for a primary ballhandler.” For the record, Harper is currently 59th on ESPN’s draft board; the draft is 60 players long. Research shows playing well in the tournament tends to move players way up, so here’s a prediction Harper will hear his name called in June. “I think he’s a stud. I think he’s a stud.” (Saying it twice = exponential.) That’s Brad Stevens on D’Angelo Russell. (D’Angelo pass from last night.) David Griffin used to work with Kyrie Irving in Cleveland, and recently said that he thinks the Nets would be a good fit for Kyrie, because “he likes what they’ve done there, culturally.” But could Kyrie really share the spotlight with D’Angelo? Here’s a meaningless and short clip where they seem to get along just fine. Remember when Mikhail Prokhorov said he would move the Nets to Moscow and then completely and totally did nothing of the sort? What was that about? A question from a recent TrueHoop post, in which Vladimir Putin is part of the answer. If you’re considering Jason Kidd’s prospects as a head coach, you probably already know that the Bucks improved a ton when he left. What you might not know is that Ben Falk has done an incredible job on Cleaning the Glass, in showing and explaining that Kidd’s defensive style generally “didn’t work in the modern NBA.” With apologies to Ben, here’s my best attempt at a shorthand summary: Kidd’s style was built on player movement and pressure. Post-Kidd, the Bucks put a bigger premium on keeping somebody in the paint protecting the rim, being a little more selective in sending bodies flying all over the place. Importantly, when Kidd’s style did work pretty well (only a few years ago), even then it disappointed in the playoffs. The other night Gregg Popovich lost it on a referee. I know he’s generally seen as the NBA’s wise sage, but he has always had a harsh edge. Why would it come out now? My impulsive reaction: the Thunder have lost seven of nine, which means suddenly the Spurs are in an every-game-matters death match with the chance to avoid the Warriors in the first round. Playing against teams based in New York City, James Harden is averaging 59.5 points per game this season. Also, and I can’t begin to explain this, but at the same link you can see that he’s better with zero days’ rest than any other number of days rest, and especially bad with long rest. That’s not how humans work, normally. Without Jusuf Nurkic, Thorpe makes a convincing case on TrueHoop, the Blazers should go into underdog mode, and shoot way more 3s. Including Enes Kanter, who attempted one last night—his first in a week—and missed it. Progress? Thorpe notes that both Damian Lillard and C.J. McCollum make 3s at a higher rate than James Harden, but Harden shoots as many of them as the Blazer guards combined. “Without Nurkic,” he writes, “each should be averaging a dozen or more 3s a game, starting now. Let them shoot early in the clock. Or late. Anytime they can see the rim.” Lillard attempted six last night, McCollum sat out. Seth Curry, though, he is on board, and made five of nine. The Warriors had just lost a game with some tough calls by referee Marat Kogut. Steph Curry, Kevin Durant, and Steve Kerr had varying degrees of ire. Curry and Durant reportedly taunted Kogut in game. After the game, in some cases, they took the rare step of calling out a referee by name. Then Draymond Green tweeted something cutesy, above, that has been widely interpreted to liken Kogut to Tim Donaghy. This is sour grapes after a loss. It’s also, potentially, a lurking credibility issue for the league. Here’s a current elite player using “TD” apparently to imply not just what the NBA admits to—former referee Tim Donaghy gambling on games—but a referee doing what the NBA doesn’t admit to: making improper calls in those games, more commonly known as fixing games. That hasn’t always been the accepted version of what Donaghy did, but it seems to be catching on since the NBA’s article of the year. If I ran a league at the vanguard of legalized sportsbetting, one that has campaigned for massive gambling revenues in the form of an “integrity fee” on gambling, I would be very concerned about, well, integrity, and the appearance of integrity. If a top player believes it’s possible games are fixed by corrupt referees, that’s a problem with big implications and no easy solutions. Thank you for reading TrueHoop! 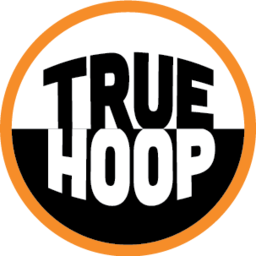 Returning soon: The TrueHoop Stat Geek Smackdown, only this time you can play too. TrueHoop COO Judy Goodwin has informed me she is already ordering a trophy.